Okay, the night was actually clear, but still very dark, as I stood at the 30 L fermentor, preparing to take a sample. It was 11:00 PM, and I was annoyed at myself for having scheduled my 12 hour time point sample so late at night, especially on Halloween. “Okay, I’m just going to take this sample and then head out to the Halloween party,” I said aloud, as I bent to open the valve to steam the sampling line. I find that talking to myself, especially when my nerves are bucking like wild mustangs, helps the jitters (or so I tell myself). A large popping sound erupted from behind me, nearly scaring me out of my costume. I laughed nervously as I realized it was the air compressor releasing pressure. I heard this familiar din several times each day and I rarely gave the short bursts of air any thought, but tonight the noise seemed eerie, almost malicious, in the fluorescent glow of the laboratory lights. Get it together, I scolded myself. The longer you take to do this, the longer you have to be here by yourself. I checked my watch as steam began to pour out of the bottom of the vessel. It was only 11:10, so I would still have plenty of time to make it to the party. The building groaned quietly with the hum of various pieces of lab equipment. In the full light of day, these noises would have been commonplace, but now they only unnerved me. I hummed to myself to drown out the disquiet of the surrounding environment. A moment later, I closed the steam valve, then opened another valve to allow the sample to flow. Frothy liquid the color of a latte poured into my sampling container. Once the collection vessel was full and capped, I quickly turned the valve shut and marked the date and time on my tube. The weight of something on my shoulder evoked a shriek like a banshee’s from within me. “Are you alright? !” It was my co-worker Srujana, staring worriedly at me. “What are you doing here?” I managed to gasp. I was rather impressed with myself for having held onto my sample despite jumping halfway across the room. “I got a high foam alarm on my phone. I was afraid the tank was foaming out, so I drove over to check on it.” I turned to look at the vessel. There was no foam visible in the tank, and the alarm was as silent as a graveyard. “That’s strange,” I said to myself as much as to Srujana. “There’s no foaming issue that I can see, and I’ve been here for a while.” I checked my watch again. Eleven twenty-five. “We should probably call the manufacturer on Monday to have someone come look at it.” I nodded in agreement to Srujana’s suggestion. “What are you wearing?” Srujana inquired as I put my sample into the refrigerator. I had almost forgotten about the Halloween party between scaring myself and being scared by my colleague. I grinned and proudly pointed to the hundreds of cilia covering my body suit. “Mecium” was written across the front of my shirt. “I’m one half of a pair of mecium, a paramecium, get it?” Srujana sighed skeptically and shook her head. “Well, looks like I’m done sampling, so I should get going. Want to walk out together?” I secretly hoped Srujana would say yes so that I didn’t have to walk to my car by myself. I may love Halloween, but that doesn’t stop me from being afraid on the spookiest night of the year. As I opened the door to leave the lab, a loud crash echoed in the cube area. “What was that?” Srujana asked with alarm in her voice. “I don’t know, but maybe we should just go,” I responded. Srujana looked again towards the offices, then proceeded to walk through the door to where our desks were located. I sighed and followed, knowing this was a very bad idea. We were immediately greeted by the sight of overturned desks and destroyed cube walls. Computers had been ripped from their outlets and smashed on the floor, and papers covered almost every inch of the space. Fear and panic began to work their way up my back. “Srujana, we really need to go. Right now.” Another loud crash sounded in the breakroom. I grabbed Srujana’s hand and began to pull her towards the building’s exit. The noise that had just been in the breakroom began to get louder, indicating it was coming towards us. “Oh crap, oh crap, oh crap,” I repeated over and over, hoping to make it to the exit before the sound, and the spirit making it, reached us. “What’s going on?” Srujana demanded, now upset and scared. “Who turned over all the desks?” “Not who, but what,” I corrected. “I have a strong suspicion we’re dealing with a poltergeist.” “A poltergeist? You can’t be serious.” Before I could argue, a knocking noise began to echo near the exit. Within a few seconds, the back door had been ripped off of its hinges, leaving the door frame gnarled and twisted. “Okay, change of plans, follow me back to the lab!” Srujana and I raced into the fermentation lab with neither of us daring to look at the sound following behind us. “Oxygen!” I shouted to Srujana as I began to dig furiously through my lab bench drawer. “What do you need oxygen for?” she questioned but began to lug the heavy tank over to where I was. “We’re going to trap the poltergeist but we need fire to direct the spirit to the trap.” I expected Srujana to demand an in-depth explanation, but she silently wheeled the oxygen tank where I pointed. I lowered myself onto the floor and hastily drew a large circle with the chalk I found in the drawer. I next traced the intricate lines of the trap to form the sigils that would hold the poltergeist in place. A large knocking began to bend the lab door in at the middle. “The door won’t hold much longer!” Srujana yelled as I finished the last lines of the trap spell. I ran to where Srujana stood with the oxygen tank. The two of us huddled behind the laminar flow hood, where we would mostly be sheltered if the poltergeist began its ritual of destruction. Seconds passed and then this door was also ripped off its hinges. The door fell inward with a frightening thud. The unfortunate thing about poltergeists is that you can’t actually see them. They are invisible spirits, shielded from the non-magical, naked eye. The fortunate thing about poltergeists is that they’re extremely sensitive to fire. As soon as I saw tip boxes and pipets being strewn across the floor, I knew where the poltergeist was located. “Now!” I called to Srujana as I simultaneously lit and threw the makeshift molotov cocktail I had cobbled together from 95% ethanol and paper towels. I thought darkly to myself this was definitely one of those times I was glad I decided to become a fermentation scientist instead of going into bioinformatics. Computer code isn’t nearly as flammable as ethyl alcohol. She dropped the line from the oxygen tank and slid down the wall to rest wearily on the floor. I came over to her and followed suit. The fire from the cocktail died down a few minutes later, but neither one of us made a move to leave. The adrenaline that had filled my body minutes before now subsided, and I felt tired and cold. I watched the soft silver light pulse gently, the trap seeming to hold the malevolent creature within. After the silence seemed to stretch on forever, I finally spoke. “I think the poltergeist drew us here. Or at least, it drew you here.” “What do you mean?” “I thought it was weird that you got a text saying there was high foam, when there was clearly no foam in the tank. Normally I would have chalked that up to faulty equipment, as it’s certainly been known to happen, but once the poltergeist began to attack us, I knew what had happened. Normally poltergeists just make a lot of noise and leave a wake of material destruction, but they have been known to lure people to their deaths.” I didn’t add that it was always the most sinister ones who beckoned unsuspecting victims to their timely demise. Srujana seemed to size me up for a moment. “I’m a little surprised at you.” “How do you mean?” I responded. “You’re so scared of everything. Like tonight. You nearly jumped out of your skin when I tapped you on the shoulder, and you’ve told me before that you’re afraid to walk to your car in the dark even though it’s only a couple of hundred feet to our building. You’re a witch. Why are you so afraid of things?” I looked her straight in the eye to convey just how serious I was. “People tend to be the most afraid when they really know what’s lurking out there in the dark. Being a witch doesn’t make me invulnerable to danger, it just makes me better prepared to handle that danger. In my experience, people who aren’t afraid of anything are the ones who get eaten first.” Srujana looked grim but made no other comments. “Okay, let’s get out of here.” I walked her to her car and waved her off as she sped out of the parking lot. I looked at the building one last time before getting in and driving away. “CRAP!” I exclaimed and beat my hands on the steering wheel. 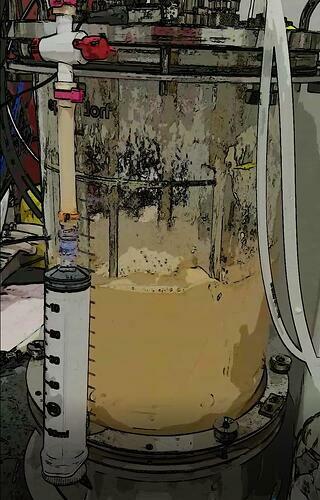 The oxygen tank we had used to force the poltergeist into the trap was feeding my fermentation culture. Without the extra oxygen to sustain it, my culture would most likely be dead within a few hours. Oh well, I thought to myself as I drove onto the highway. Better for my culture to be dead than me.